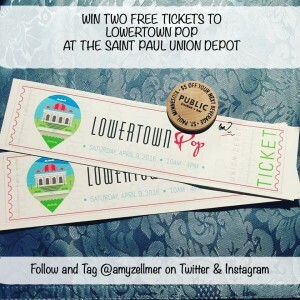 This past week I was one of about 50 Minnesota bloggers invited to a attend a preview of the Lowertown Pop at the Union Depot in Saint Paul. Lowertown Pop is a Minnesota Maker movement, a pop-up shop, and crowd funding platform to benefit Face to Face as well as Minnesota Makers. The Pop features local artisans and craftmakers, brewers, bakers, distillers, artists, musicians, and so much more! Lowertown Pop will be open to the public on Saturday, April 9th from 10am-4pm. Tickets are on sale for $10 in advance, and $15 at the door and 100% of ticket sales go to Face to Face and one lucky Minnesota maker! YOU CAN WIN TWO FREE TICKETS!!!!!!! As part of my preview experience, I received a Swag Bag full of samples and goodies from the Makers. I have to tell you, this is one seriously impressive group of vendors! This is an event you won’t want to miss!!! If nothing else, go for the inspiration! want two FREE tickets and a drink token?? ?